The Adidas Adizero Tempo Review : Form and Functionality? So you read the header and it's gonna be one of those reviews again. Yes, it's one of those write-ups that would hinge on my verbose and completely un-expertlike opinion. But before we talk about this... .
Let's go back a couple of years... ... .
As I had mentioned before, was never really a fan of Adi Dassler's creations. Okay maybe I was . Once. I took the plunge a long time ago, from a time and place that seems to have been relegated to the far recesses of my mind. Wore the Kobe Bryant KB8 "Feet You Wear" shoe during my senior year just because they looked so different from any basketball shoe that was on the market at the time. It was the new "in" thing. And in high school's ever changing lexicon of social stratification, different + new = social status level up. Lord I'm such as sucker for effective advertising (x_x). I thought they were the coolest things ever, bragged about them incessantly, could have sworn they improved my standing from "freaky tall geek" to "he's just really strange don't mind him he has cool shoes anyway". But then the real test came when I had to play ball with it. With a lot of confidence, I went up for a fancy "tapboard" (people who played high school ball could relate), made my best Kobe impression and BAM I fell with a thud, breaking my ankle in three places. Strangely enough, my juvenile incarnation blamed the Adidas shoes for that, swore it to high heavens, and never wore another pair again... .. Flash forward to 2009, and lo and behold I have a pair of Adidas Adizero Tempos staring me in the face. Literally begging for a shot at redemption. Like a scorned lover acceding to one last shot at reconciliation, I took a leap of faith and went for it. Did it work out? Let's see how my 3-week dalliance with an old flame has worked out so far. It is a lightweight running shoe designed to give runners comfort and support over long distances. ForMotion stability adapts to the ground for improved handling and stability and the pro-moderator medial support device prevents overpronation. The TORSION SYSTEM gives midfoot integrity and adiPRENE in the forefoot maintains propulsion and efficiency. The air mesh upper gives maximum ventilation and the perforated EVA tongue gives additional lightweight comfort and breathability. The dual-layer anti-microbial adiLite-respoEVA sockliner controls odor and gives added step in comfort. Finally, the adiWEAR outsole offers the ultimate in high-wear durability. Dazed Reader, through SMS : WOAH. BLAH BLAH BLAH. You're talking Greek here! What the fudge was that all about??? Okay, okay. Let me give it a shot. 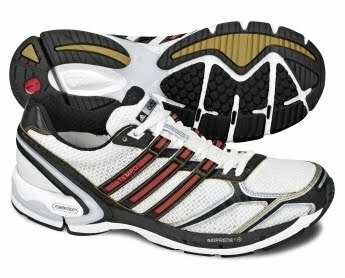 The cushioning system of the shoe is backstopped by its hyped- up Formotion technology utilizing Adiprene 45 . The logic behind it is that you have a well-cushioned heel but not enough to make it bounce around during hard runs. Note, too much bounce = pain and suffering . Some more seasoned runners may view this as completely "babying" heel strikers, but that's one of the reasons why the Tempo is quite enticing to newbie runners. In addition, mild overpronators can count on the shoes aptly named pro-moderator system to negate the level of pronation, utilizing two plastic heel plates that slow side-to-side movement. And if just to avoid more jargon, the shoe has features which make it very breathable inside and minimize stitching, while providing good forefoot touch-off cushioning for the fast people out there. The Tempo has been touted as the "performance stability" shoe in the Adizero series, providing the benefits of a lightweight racer along with enough stability to prevent you from blowing up your plantar or ITB. 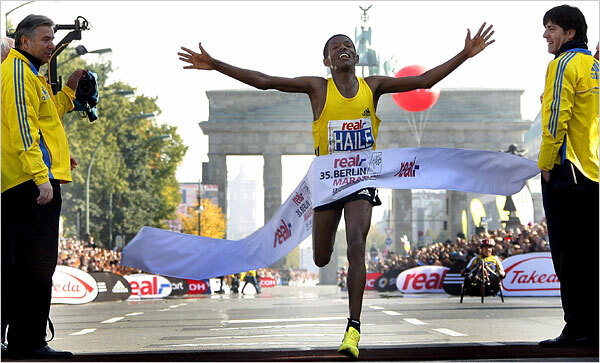 To those relatively unfamiliar with the Adizero line, these have been touted to be the lightest in their class, and have the distinction of being the shoes running legend Haile Gebrselassie used when he broke the marathon world record at Berlin. Its main selling point is that at barely 300 grams, the Tempos are nearly a 100 grams lighter than my old light stability shoes. Upon wearing them, you would barely feel that there's any resistance there at all. You can accelerate without the weird clunky feeling. 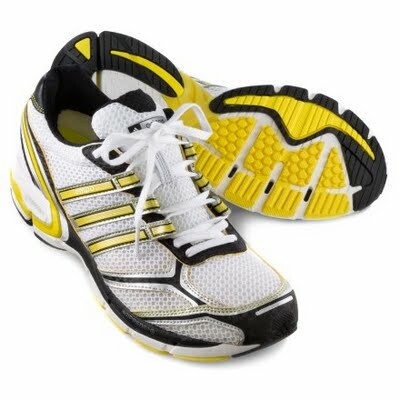 At first, I was very apprehensive to try these out, as they look like the eye candy shoes you would wear to the mall and it seemed to me that any form of running on these would blow out my knee. Initially thought that these were limited to neutrals, but after nearly a month of using them, the injuries have thankfully been nowhere in sight. And to think I was coming off a bout with ITB. Whew. After a few weeks on this, an attempt to use my old light stabs gave the feeling of having ten-pound weights on my foot. The difference was very noticeable. How noticeable? A good example was my tempo training on consecutive days. Same splits, same level of fitness, different shoes. With the old shoes, my best split was a 5:10/ km. The following day, same thing, I miraculously lowered it to a 4:40. I highly doubt I could have shaved 30 seconds off my split in a day. Was it the shoes? Placebo? Whatever it may have been, happy camper right here. Racing-wise, two weeks later I set a 10k PR of 50:14 with the Tempos, shaving nearly a minute and a half off my previous best. The time was good enough for 26th place at Ayala Eco-Dash, which made me an even happier camper. Pertinent factors to keep in mind : No changes in training, weird level of fitness coming off an injury. Could it have been the shoes? You be the judge of that. These are NOT wide shoes. When you first slip into them, coming from say a Mizuno or New Balance, your feet would feel constricted and with no wiggling room. I'm a US size 12, and these usually afford sufficient toe allowance. These ... did not. First time I ran on them they were so tight that I got near blisters on my toes. I was about to completely give up on them and sell them to the people at Takbo.ph (even if I knew that they're going to ask for a ton of discounts) when the pain started to... disappear. Now I don't even notice it's there.It took about two weeks worth of break-in to get the job done. So for the well-endowed people out there, either you adjust your size or break it in well before racing it. Overall I find this to be the quintessential, aesthetically pleasing shoe that strives to synergize both form and functionality. For neutrals to mild overs looking for a highly serviceable speedwork or raceday shoe, this brings significant eye candy points to the table with decent stability to boot. Should you fall under this category, this is a very strong option right here. So how would I evaluate the three-week reco with my old flame? Love affairs come and go, that's the nature of the beast. As one leaves for greener pasture, another comes in to fill the void. Everything that happens in between? Oftentimes forgotten. But sometimes, all it takes is a single spark to reignite the connection. I hated Adidas. They broke my ankle. Guess old flames aren't so bad the second time around.